be at least 3 letters long. 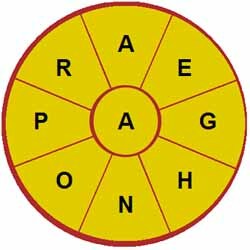 contain the central letter in the wheel. Some correct answers in this example are Rag, Rage, Age and Harp. Notice that each answer is at least 3 letters long and contains the middle letter A. Also bear in mind that there is at least one 9 letter word in each puzzle. The 9 letter word in this example is Orphanage, however sometimes there are more than one. By clicking on the letters in the wheel in the order they are spelt. By typing out your answers in the box provided. The next step is to click on the Enter button or press the Enter key to submit your answer. A message on the screen will then inform you about whether you answered correctly or not. All correct answers you have given will be listed on the right-hand side of the screen in a box, along with your total number of correct answers. After receiving your final score, you will be presented with a screen showing all of the answers and which ones you managed to find. To make it more interesting, you will be shown a statistical breakdown of your results. You have a choice of playing a 2, 3 or 5 minute game. There are over 95,000 words in the database. You'll never play the same puzzle twice.